Adelia Leslie was born in Picton, Ontario on 17 November 1914, the daughter of George and Annie Leslie. She attended the Belleville General Hospital School of Nursing, graduating in 1936. She married Albert Warren and the couple moved to Port Hope in around 1950. She died there in 2009 (obituary at http://rossfuneralchapel.frontrunnerpro.com/book-of-memories/2106477/Warren-Adelia/obituary.php). From the estate of Adelia Warren. Transferred from Port Hope Public Library in May 2017. 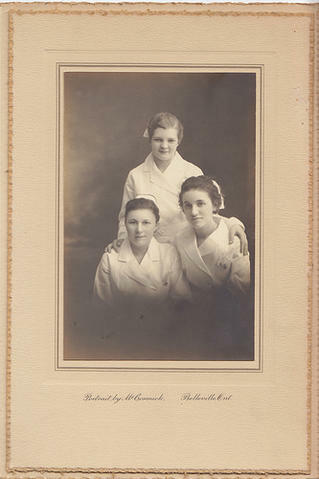 Two scans of photographs of Adelia Leslie, a graduate of the Belleville General Hospital School of Nursing, and her classmates. Also her copy of the commemorative volume 'Belleville General Hospital School of Nursing 1893-1970 and Edith Cavell Regional School of Nursing 1968-1974'. The original photographs and other materials were transferred to the Prince Edward County Archives, as they included other photographs of Adelia Leslie's life in Picton. Originals in the Prince Edward County Archives.